Uremic cardiomyopathy, which features left ventricular hypertrophy, diastolic dysfunction, and impaired myocardial strain, predicts mortality in patients with CKD. 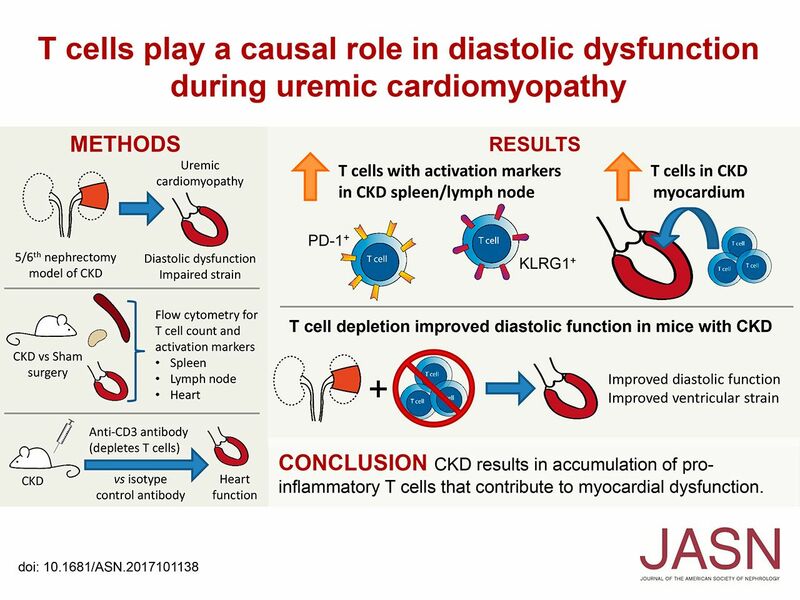 In this study, the authors present findings supporting emerging evidence that T cells play a causal role in diastolic dysfunction during CKD. In a mouse model of CKD, they demonstrate that T cells infiltrate the heart and lead to diastolic dysfunction and impaired ventricular strain, whereas depletion of T cells improves diastolic function and myocardial strain. They also show that in children with CKD, increasing frequency of T cells bearing markers of sustained activation (PD-1 and CD57) is associated with echocardiographic indications of worsening diastolic function. Future research may inform novel therapies that target T cell function to mitigate early subclinical myocardial dysfunction during CKD. Background Uremic cardiomyopathy, characterized by left ventricular hypertrophy, diastolic dysfunction, and impaired myocardial strain, contributes to increased cardiovascular mortality in patients with CKD. Emerging evidence suggests a pathogenic role for T cells during chronic heart failure. Methods To determine whether T cells contribute to uremic cardiomyopathy pathogenesis, we modeled this condition by inducing CKD via 5/6th nephrectomy in mice. We used flow cytometry to assess expression of markers of T cell memory or activation by lymphocytes from CKD mice and controls, as well as lymphocyte capacity for cytokine production. Flow cytometry was also used to quantify immune cells isolated from heart tissue. To test effects of T cell depletion on cardiac function, we gave CKD mice anti-CD3 antibody injections to deplete T cells and compared heart function (assessed by echocardiography) with that of controls. Finally, we correlated T cell phenotypes with structural and functional measures on clinically acquired echocardiograms in children with CKD. Results Mice with CKD accumulated T cells bearing markers of memory differentiation (CD44hi) and activation (PD-1, KLRG1, OX40), as reported previously in human CKD. In addition, mice with CKD showed T cells infiltrating the heart. T cell depletion significantly improved both diastolic function and myocardial strain in CKD mice without altering hypertension or degree of renal dysfunction. In children with CKD, increasing frequency of T cells bearing activation markers PD-1 and/or CD57 was associated with worsening diastolic function on echocardiogram. Conclusions CKD results in an accumulation of proinflammatory T cells that appears to contribute to myocardial dysfunction.